Milestone inscribed in Greek. Vicinity of Marvdašt, Fārs province, Iran. Late fourth or early third century BC. Found by A. Kabiri (Iranian Cultural Heritage Organization), 1978. Persepolis Museum, no. 3410. H. 0.46 m, W. 0.28 m, Th. 0.25 m.
Miniscule rendering of Callieri, P. 1995. 'Une borne routière grecque de la région de Persépolis (information).’ Comptes rendus des séances de l'Académie des Inscriptions et Belles-Lettres: 66-68. The stone is stated to have been discovered some three kilometers southwest of the city of Marvdašt, on the left side of the road leading to the village of Amrābād (Kabiri 1373/1993-1994, with drawings and photographs of the find). It consists of the upper half of a stepped merlon of black limestone, engraved, evidently in secondary use, on the front and back sides with brief Greek texts which record, respectively, the distance measurements of 'sixty stades' and 'twenty stades' (Kabiri 1373/1993-1994: 197, with initial readings of the two texts by Mehdi Rahbar; Callieri 1995: 67-68, fig. 1, with emended reading of the text on face B; Canali De Rossi 2004: no. 247; Merkelbach and Stauber 2005: no. 310; Rougemont 2012: no. 64). The merlon's shape and fine-grained black limestone are both encountered in Achaemenid construction at the nearby site of Persepolis, where one equally finds direct parallels for the merlon's (now largely broken-off) decorative stepped niche (Kabiri 1373/1993-1994: 196-197; Callieri 1995: 65-67, with remarks about the quality of the stone by Giuseppe Tilia [cf. Tilia 1972: 243 n. 3] and Persepolitan parallels; Schmidt 1953: pl. 26 [Persepolis stone merlons]). The letters of the inscriptions are broadly datable in the later fourth or the first half of the third century BC (Callieri 1995: 69; cf. Callieri 2007: 35 and Rougemont 2012: 129 and n. 404, for a narrower estimate in the end of fourth/beginning of third century BC). The particular localities (settlements? road stations?) to which the two different distance measurements applied are subject to different interpretations. Based on a stade length of approximately 185 m (cf. Bernard 1995: 77 n. 45), the 60 stades (ca. 11 km) recorded on face A roughly correspond to the distance between the milestone's find spot and Persepolis. In one view, therefore, which assumes that the milestone was found more or less in situ, face A would have marked the distance to Persepolis (Kabiri 1373/1993-1994: 200; Callieri 1995: 70-72; Bernard 1995: 82). The measurement of 20 stades (ca. 3.7 km) on face B was variously suggested, in turn, to represent the distance from the milestone's find spot to some Seleucid foundation in the Persepolis plain (Callieri 1995: 72-73, leaving open the possibility [p. 73 n. 34] that this foundation could even be the hellenistic polis of Antioch in Persis, whose location remains elusive), or to an ancient crossing of the River Kor in the vicinity of the Pol-e Khān bridge, on the main route connecting Persepolis with Susa (Bernard 1995: 80-82, sketch map p. 71 fig. 2). In another estimate (Aperghis 2008: 140), which emanates from an analysis of travel routes from Persepolis based on the testimony of Achaemenid chancery documents from the latter site (the Persepolis Fortification tablets), the milestone may have stood initially in the immediate vicinity of the Pol-e Khān river crossing, and pointed to two travel stations located in either direction of the Royal Road from Persepolis to Susa. 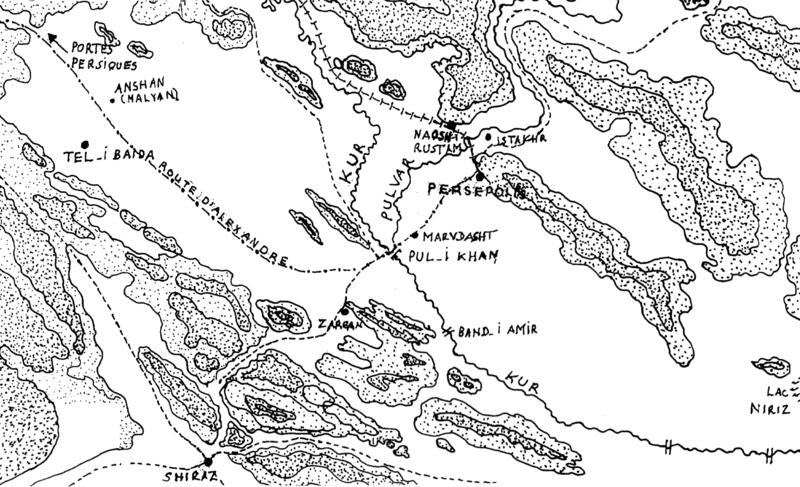 One of these stations, identified with the Hadaran mentioned in the Persepolis tablets, would be located in the vicinity of Marvdašt, some three or four kilometers from the Pol-e Khān river crossing. The second one, identified with the Antarrantiš of the tablets, would be located at Zarqān, some 11 kilometers from the same crossing in the direction of Shīrāz. The measurement of road distances formed an integral part of the official Achaemenid road system (e.g., Hdt. 5.52-53, reporting distances on the Persian royal road in Persian parasangs and giving their equivalents in Greek stadia/stadioi; Graf 1994; Briant 2012). 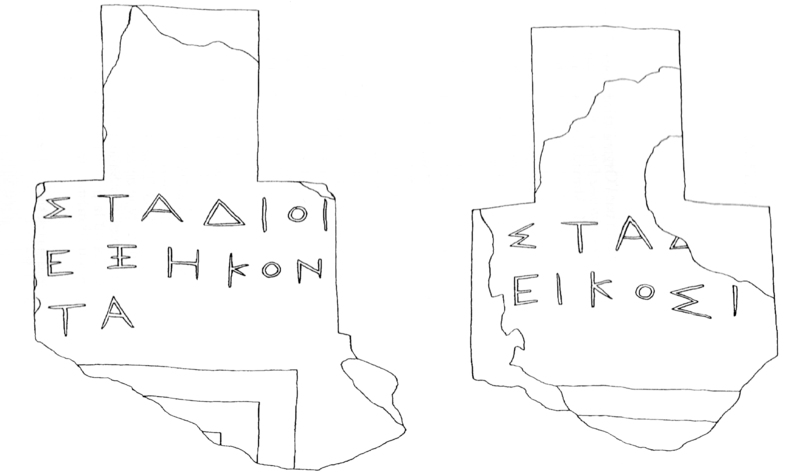 Persepolitan documents also conceivably allude to official Achaemenid 'road surveyors' (Graf 1994: esp. 174 and, earlier, Hallock 1978: 112; cf. Briant 1996: 374, 952 and idem 1997: 81) — who perhaps corresponded to the bēmatistai ('those who measure by paces') of Alexander III and Seleucus I (e.g., Jacoby 1962: nos. 119-123)? To date, however, archaeological excavations and surveys conducted in Iran have failed to produce any examples of road-distance markers from the Achaemenid period (e.g., Young 1986 [Kangāvar valley]; Sumner 1986 and Boucharlat et al. 2012 [Persepolis area]; Askari Chaverdi et al. 2010 [Mamasanī valleys]). At least on extant evidence (e.g. Callieri 1995: 67-70 and Bernard 1995: 87-95; cf. Callieri 2007: 35-36), like the milestone from Pasargadae, the Marvdašt distance-marker could refer us primarily to a Greek practice of erecting road markers, and to the application of this practice by Alexander III and his successors on a larger territorial scale, as a part of these rulers' efforts to enhance the unity of their extended realms (cf. Bernard 1995: 75). Aperghis, G. G. 2008. ‘Managing an empire – teacher and pupil.’ In Darbandi, S. M. R. and Zournatzi, A. (eds. ), 1st International Conference, Ancient Greece and Ancient Iran: Cross-Cultural Encounters, Athens, 11-13 November 2006. Athens: 137-147. Askari Chaverdi, A., Khosrowzadeh, A., McCall, B., Petrie, C. A., Potts, D. T., Roustaei, K., Seyedin, M., Weeks, L. and Zaidi, M. 2010. ‘Archaeological evidence for Achaemenid settlement within the Mamasani valleys, western Fars, Iran.’ In Curtis, J. and Simpson, St J. (eds. ), The World of Achaemenid Persia. History, Art and Society in Iran and the Ancient Near East, proceedings of a conference at the British Museum, 29th September - 1st October 2005. London: 287-298. Bernard, P. 1995. ‘Remarques additionnelles’ [to Callieri, P. 'Une borne routière grecque de la région de Persépolis']. Comptes rendus des séances de l’Académie des Inscriptions et Belles-Lettres: 73-95. Boucharlat, R., Gondet, S. and de Schacht, T. 2012. ‘Surface reconnaissance in the Persepolis plain (2005-2008). New data on the city organisation and landscape management.’ In Basello, G. P. and Rossi, A. V. (eds. ), Dariosh Studies II. Persepolis and its Settlements: Territorial System and Ideology in the Achaemenid State. Università degli Studi di Napoli ‘L’Orientale’, Dipartimento Asia, Africa e Mediterraneo, Series Minor LXXVIII. Naples: 249-290. Briant, P. 1996. Histoire de l’empire perse. De Cyrus à Alexandre. Paris. ——. 1997. ‘Bulletin d’histoire achéménide 1.’ Topoi, Supplément 1: 5-127. ——. 2012. 'From the Indus to the Mediterranean: the administrative organization and logistics of the great roads of the Achaemenid empire.' In Alcock, S. E., Bodel, J. and Talbert, R. J. A. (eds. ), Highways, Byways, and Road Systems in the Pre-Modern World. Ancient World: Comparative Histories V. West Sussex: 185-201. Callieri, P. 1995. 'Une borne routière grecque de la région de Persépolis (information).’ Comptes rendus des séances de l'Académie des Inscriptions et Belles-Lettres: 65-95. ——. 2007. L'archéologie du Fārs à l'époque hellénistique. Quatre leçons au Collège de France, 8, 15, 22 et 29 mars 2007. Persika 11. Paris. Graf, D. F. 1994. 'The Persian royal road system.' In Sancisi-Weerdenburg, H., Kuhrt, A. and Root, M. C. (eds. ), Continuity and Change, proceedings of the Last Achaemenid History Workshop, April 6-8, 1990 – Ann Arbor, Michigan. Achaemenid History VIII. Leiden: 167-189. Hallock, R. T. 1978. 'Selected Fortification texts.' Cahiers de la Délégation archéologique française en Iran 8: 109-136. Jacoby, F. 1962. Die Fragmente der griechischen Historiker, IIB. Leiden. Kabiri, M. A. 1373/1993-1994. ‘Kašf-e sang-e masāfat namā "sang-e kiloumetr" dar Marvdašt’ [‘A milestone discovered at Marvdasht’]. As̠ar 22-23: 196-200. Sumner, W. M. 1986. 'Achaemenid settlement in the Persepolis plain.' American Journal of Archaeology 90: 3-31. Tilia, A. B. 1972. Studies and Restorations at Persepolis and Other Sites of Fārs, I. IsMEO Reports and Memoirs XVI. Rome. Young, T. C., Jr. 1976. 'An archaeological survey of the Kangāvar valley.' In Bagherzadeh, F. (ed. ), Proceedings of the III Annual Symposium on Archaeological Research in Iran, Tehran 1974. Tehran: 23-30.